Since from the last 10 days we have received a lot of queries from our readers asking about one thing that our blog traffics is going down & decreasing day and day, how to recover we did not receive massive traffics as it was going on before. So after researching and analysis about the issue PBT editorial team finally came to know the exact answer and today we will show you why you are unable to get traffics or losing your rank in Search Engine Result. 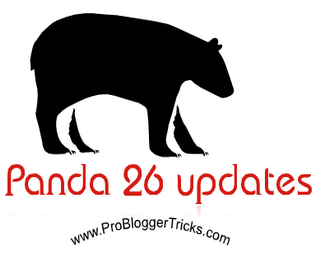 So our today post will be all about the panda 26 updates. To know curiously about panda updates First of all you should must know and have little knowledge about the previous updates and new panda update and do compare your blog statistic in analytic with all the previous and new versions. To know the exact result the your blog is being penalized by Panda, lets do this, open your Google Analytic and do compare your blog rank from july 20, 2013, to current date, If there is continuous step by step zig zag path with dropping rank stats then chances are high that it may be effected by 26 panda. While seeing dramatic change in increasing your blog rank in the same duration then not worry you are still safe from panda update. After checkout your blog in Google Analytic now you must have come to know either your blog is penalized or not however if you have been penalized by Panda then following are the tips given below which would help in bringing out your blog from panda effects and will treat your blog again for better SERP results. So before get diseases by panda lets hurry and do the following tasks and save your blog. 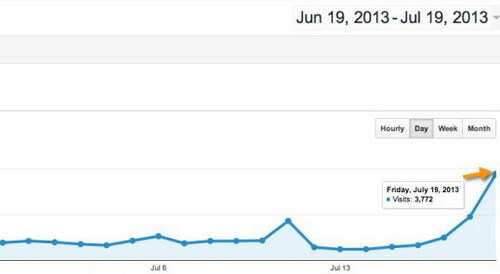 What Your Blog Statistics Says After Panda Effect: ? My traffic has increased rapidly ! Didn't know that an update has rolled out until i read this post ! Wow thats surprise for you, You are still safe from Panda, Hope you would run your blog with white SEO in future thanks Rizwan brother to land with us. Hope my traffic get improved according to the Google analytics. Thats great news Nirmala man, You will get massive traffics more in few days, after panda 26 update many were penalized while most of them rank well in SERP several times more. Thanks to land with US. hi..the traffic on my blog www.webcodeexpert.com is getting increased day by day from 20 july..almost 5 times increased..is this due to panda? Yes we can surely say that it may happened due to Panda update, Panda will increase blog traffics and show more visibility in SERP if the blog is generating quality contents and applying white SEO technique. again thanks easily solve the my problem. i am recovered in my blog and easily this update view of the month hafeez bro plz help panda update effect should be drop ranking like Alexa! Improved alexa Rank and continuously increasing traffic for my blog. Happy Day for me. hold a minute. how can you confirm it that panda update on 18 july?? is any information about google Update PR? don't you think this time take time so looooong? My traffic is increased a little bit...... Still confused why coz i thought i will get a good amount of traffic. Its amazing for you that you are still receiving that much traffics.. I am experiencing massive traffic these days, fortunately i am applying all white hat seo Technics ,hard work pays off.Nice article tough learned lots of things today ! Yes Do the same never go ahead for Black hat because instant of time you will get rank but after some time you will easily penalized. thanks rizwan for sharing your thoughts. Wow..... Really is it true ?? My Traffic is also increased. Thanks for sharing this info. Hafeez brother i also affected by Good Panda. but panda update on 18 july and my traffic lost on 27th July what is this reason. is any tool to check whether Google penalized my site or not. Thanks for sharing this information i really use this type of details. My blog traffic is also increasing. Thanx..
My blog's traffic was also dropping. But now its everything is fine. I’m estatic to see a new post, I was going through detriment. I get a charge out of reading your work, I can’t get enough of it. its Amazing Bro Congrats! Ads Here Like Happy..
Great post I really enjoyed while reading this post. In this post you added all panda updates lists with date also I like the post on how to recover from effect. Thanks for sharing such great list. Thank you for the suggestion. I have done all correct seo for my website. But still has gone down the rankings. How to find out whether it is affected by Panda? I think this update was something that contradicted all tactics used to promote website. They are penalizing backlinks now.. It means there is nothing you can and no recovery is seen.. Now they tell us to remove backlinks..